For this week's Fabric Giveaway, Julie at The Intrepid Thread is offering a fat quarter bundle including ten beautiful prints from Katarina Roccella's newest collection for Art Gallery Fabrics, Wonderland! You can find these lovely Wonderland fabrics available right HERE in The Intrepid Thread Shop!! That’s 4 possible entries! Enter now through Tuesday, October 12th! The winner will be picked at random and I will announce their name at the bottom of this post, here on the blog. Thanks to all who entered our Giveaway! This week's lucky winner is Kathy! Congratulations, I will be in touch shortly! Lovely bundle. Thanks for sharing the giveaway. A bag would look good stitched with these fabrics. Thanks, Julie and Maureen! Have a good weekend. I get the Intrepid Thread newsletter. I think this would be great for fabric baskets. A lap quilt and scarf with those beauties!.Thanks for the fun. I get the Intrepid Thread newsletter and follow their blog. Beautiful fabric bundle and would make an apron for my daughter. I subscribe to IT newsletter. I am a quilter so most likely would make a quilt. I do follow your blog.thanks for the chance! Beautiful bundle. I'm making zippered pouches right now, and these fabrics would work great! Thanks! What great fabrics! I am working on a scrappy quilt top and would love to add these, and I am ALWAYS making zipper pouches! I would make pillows for the little girls in my life. I would love to stitch up a beautiful patchwork bench pillow with these lovelies! I just signed up to receive the Intrepid Thread newsletter too. I follow you on instagram and newsletter. Love this fabric. I would make a lap quilt. Matsche.christine@yahoo.com. I love those colors! I would probably make either a bag or some baskets/containers with this beautiful fabric! :) Thanks for the chance to win it! I follow The Intrepid Thread on Facebook! Thank you! I receive Intrepid thread newsletter. Matsche.christine@yahoo.com. I love this fabric . My stash is depleted along with my wallet. I would make Christmas gifts with this beautiful fabric. Pillows. O would make them for my daughters dorm room. Those are beautiful fabrics! Thanks for the giveaway! I would enjoy making a bag or pouch out of them. Happy Friday Maureen! Another lovely giveaway. Would love to make a bag with those! I would love to make a new bag with the fabrics. One for me and one for my daughter. Gorgeous fabrics. I follow you on Bloglovin and Instagram. Probably on FB too, but I am not on the site too often. I've purchased from Intrepid thread and receive their newsletter. I would to make a quilt with these. They're so pretty! Thanks for another chance Maureen!!! I'd make a hexi quilt (by Quilting is more fun than housework) for Quilts for Kids! I'd make pillows for my granddaughters. I mostly make quilts, so I think I would do that. The fabrics are lovely. I would make up a patchwork tunic or shift, love the colors. Thanks for the chance to win. Rainy day here, but it's Friday! Follow them on FB and their blog. Lovely fabric, it deserves to be stroked and gazed at for a long while before being cut up. That means I don't know hat I'd make but I do like it! I would most likely make a large tote with these fabrics like the caravan tote because I love Alice in Wonderland and think this would make a great travel bag. Not sure what I would make with it but I know it would be beautiful! I follow Intrepid Thread by FB and their newsletter. I follow you by Instagram, FB email, and Bloglovin:) Don't want to miss anything:) ha ha!!! I would make a sew together bag! I would make a mini quilt for a friend's daughter's first b-day! 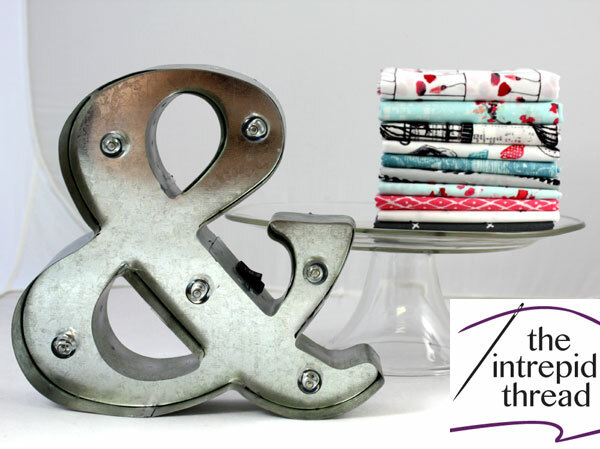 yummy fabrics - love the ampersand too! Would be making some bitty bags with it!!! I haunt you on Facebook! I follow Intrepid Thread on Facebook!! And I shared on Facebook too!!! So beautiful! I just got a fat quarter quilting book so I think I'd try out what of the patterns in there! I follow you on facebook and instagram!! I always love Art Gallery fabrics. Another winner. Thanks. Beautiful collection - looks like the beginning of a quilt to me, that's what I'd do. I like Intrepid Thread on Facebook. I've considered red and aqua to be Christmas colors for a while, so I would probably make some pillows for Christmastime with that fabric! I follow you via Blogger and Instagram. I LOVE your pictures of your quilts; you have awesome backdrops every time. I love these fabrics! They would be great sewed up in a tote bag and/or smaller "ditty" bags for several purposes. Thanks, Maureen and Intrepid Thread, for offering these. I follow Maureen on facebook and subscribe to your newsletter. I follow Intrepid Thread on Facebook. Love them. I'm loving that fabric bundle. I follow you on FB and Bloglovin. I get so excited for Fridays and your give-a-ways!! Ooh, they really caught my eye. I'd stitch up a table topper. Or maybe even convince my eldest daughter who (gasp) doesn't like quilts, that she needs one for her new home made of these fabrics! I follow YOU on bloglovin'! :-) love your blog. I follow the Intrepid Threads blog. I would make a quilt for my granddaughter, Ellie, who is 18months old. Thank you. I follow their blog. Thank you. Thhhhhey seem lovely whimsical designs - I'd like to try my hand and bairns' items for a change. Sweet, simple, quick and would allow me to try out some new techniques! I happily receive your newsletter by email - thank you! I follow you here and Instagram. Thank you. I follow you and share on Facebook. Thank you. I follow you on Facebook Maureen and love your work. I shared the intrepid Thread facebook post and yours! I have signed up to follow The Intrepid Thread. Love theses fabrics. I follow you on Facebook and love your blog. I follow Intrepid Thread via e-mail and Facebook. I'd make a lap quilt as a house warming gift for a friend who just bought her first house. The colours would be perfect in her living room! I would make something lovely for my mum! I already follow you on FB and bloglovin get the emails too. Pretty! Pretty! Would love a new project tote. Thanks for the fun giveaway! I think I'd make a patchwork tote. I follow you here and on Instagram. Thank you for this giveway - I am wanting to try some different techniques and I would love to use these fabrics to make smaller items - maybe bairns' clothing. That you for the opportunity. I follow Intrepid Thread's blog, on FB and get their newsletter. I also follow The Intripid Thread via their Newsletter. HAPPY CANADIAN THANKSGIVING! I follow Maureen's blog and on FB. I shared the giveaway on G+ and on FB. Beautiful fabric!!! I would make a wall hanging....the colors match my bedroom! This fabric would make a lovely stuffed tuffet for my granddaughter.She loves to read her books and she'd like this fabric. I folllow you on facebook & bloglovin!!!!!!! I follow the Intrepid Thread on facebook and bloglovin! I follow you on Facebook and follow your blog. I follow Intrepid Thread on Facebook and receive their newsletter. Love the colors in this bundle. I'd like to whip up a cozy quilted winter vest. Thanks.